Assisted living is a residential option for seniors who need a little assistance with daily activities. 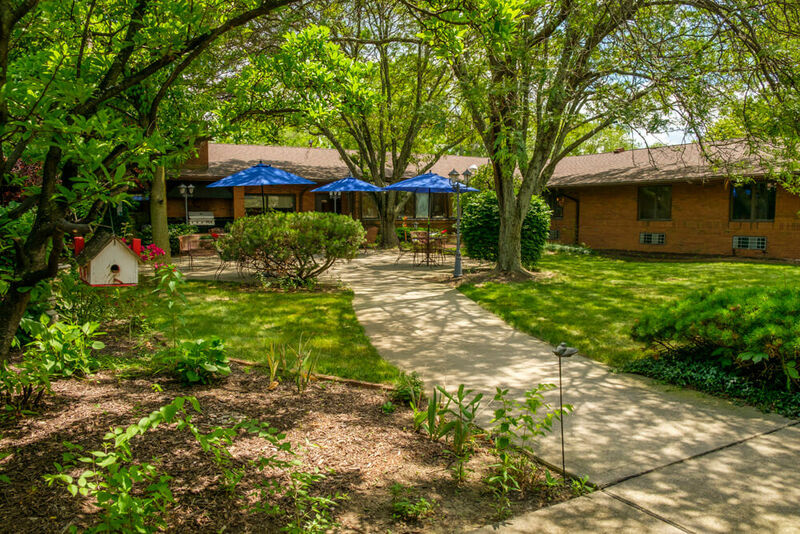 MacIntosh assisted living communities in Columbus and central Ohio offer well-appointed senior apartments, housekeeping, meals and personal care and support services as needed. An assisted living community is not a nursing home—it offers a different lifestyle. An assisted living community is for seniors who need a little assistance but are for the most part independent, while a nursing home or long-term care facility is more appropriate for seniors who have serious medical needs. An assisted living community offers medical and living assistance as well, but they’re also focused on providing a social environment with planned activities, physical wellness programs and other convenient support services that help seniors continue to enjoy active, fulfilling lifestyles. What’s Life Like in an Assisted Living Community? Wondering what life at an assisted living community would be like? It’s very similar to life at home. Residents are still able to do what they’ve always enjoyed doing—but one important difference is that they have the support they need. At a MacIntosh assisted living community, residents live in apartments that they can decorate with their own furnishings and decorations. They have access to activities like fitness classes, crafts and entertainment events, as well as nutritious, chef-prepared meals. Each resident in an assisted living community has a plan of care tailored to their needs and their doctor’s recommendations. Housekeeping, laundry and maintenance services are also included. We have assisted living communities throughout Columbus and the surrounding area, including Canal Winchester, Hilliard and Circleville. At each, you’ll find top-quality amenities and a packed social calendar. Questions about included amenities? Contact us. MacIntosh care communities offer something unique: a continuum of care. In addition to assisted living, we offer rehabilitation, skilled nursing and long-term care. That means if a resident comes into a MacIntosh assisted living community and then needs a higher level of clinical care months or years down the road, we can deliver that care on the same campus. This is important because it means you or your loved one won’t have to get used to new faces and new spaces. Additionally, it means the staff will already be familiar with you or your loved one. You will know the community and the community will know you. This continuum of care is also a benefit for couples with different need levels. If one spouse is a good fit for assisted living while the other needs long-term care, they can both live in the same building while receiving the appropriate care. May I bring my own furniture or do you provide furniture? We encourage you to bring your own furniture and to decorate your room to your personal tastes. Is there an annual lease? We don’t have long-term leases. All residents pay on a month-to-month basis. We simply ask for thirty days’ notice if and when you plan to vacate your apartment. At most of our centers, the security deposit is $1,000. The deposit is fully refundable as long as your apartment is left in the same condition as it was when you moved in. Although we have contracted with a pharmacy to provide medications to all of our residents, you may continue to have your medications filled at the pharmacy of your choice. Do I keep my medications in my apartment? You may keep your medications in your apartment. If you prefer, our nurse can secure it in our medication cart and administer it to you at the appropriate times. However, there is a charge for that service. Will a doctor see me in my apartment or do I have to go out? For your convenience, several of our attending physicians make themselves available to see assisted living residents. If you prefer, you may continue to see your own physician(s) outside the center. Just like your own home, you’re free to come and go as you wish. We only ask that you let the staff know if you’re going to miss a meal or be out of the center for an extended period of time. All meals and snacks are included in our daily rate and provided according to your dietary needs. We do our best each day to offer appetizing and nutritious meals. Whether you order from our bistro menu or choose the special of the day, we’re confident that you’ll find something that appeals to you. A private dining room for family gatherings and parties is available by reservation. Please contact the facility receptionist for information on how to reserve the room. For your convenience, the apartment is equipped with a small kitchenette. While stoves are not provided, you’re welcome to have small appliances such as a coffee maker or microwave in your apartment. Do you have any activities? Social, educational and recreational activities are available each day of the week. From music and games to crafts and religious services, we offer something for everyone. Some of our assisted living centers offer transportation to doctors’ appointments either free of charge or for a nominal fee. In any event, we will be happy to assist in arranging transportation to and from your appointments outside the center in the most cost-effective manner that’s in keeping with your needs. Can I smoke at the center? All our centers are smoke-free facilities, so smoking is not permitted in your apartment. Smoking by residents and guests is permitted only in outside designated areas. We have no limits on visiting hours. Family, friends, children and even pets are welcome to visit 24 hours a day, 7 days a week. Can guests eat meals with me? Absolutely. Guest meals are available daily and can be ordered by contacting our receptionist. Do you have a beauty and barber shop? All of our centers are equipped with a full-service salon. All salon services are billed to you. Still have questions about assisted living? You’re always welcome to get in touch with us, but we also have a free resource to help you out. Download our guide, “What Is Assisted Living?”, to find the answers you need. In it, you’ll find information on things like the difference between assisted living and skilled nursing, the costs and benefits of assisted living, how to choose the best living option and more.